ST. JOHN, Ind. 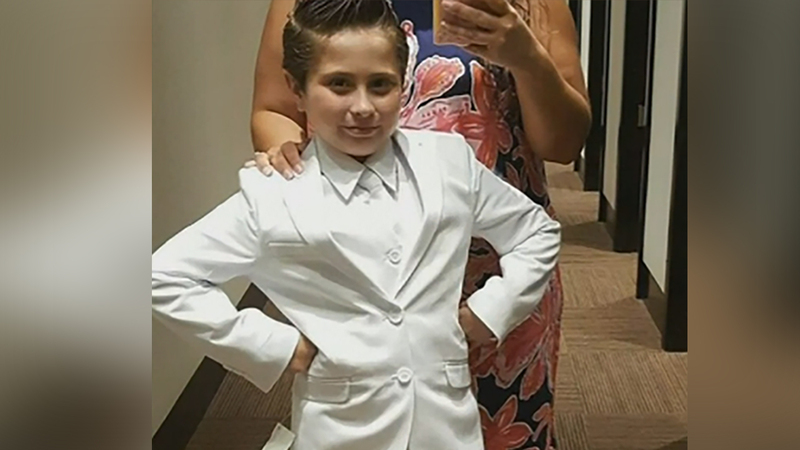 (WPVI) -- An Indiana girl who was banned from wearing a pantsuit to her First Holy Communion is getting support after her mom's Facebook post has gone viral. WLS-TV reports, the mother of Cady Mansell, 9, said her daughter planned to wear a white pantsuit to receive the Roman Catholic sacrament last month at St. John the Evangelist Parish in St. John, Indiana. "Me and my mom were talking about what I was going to wear and I said, 'I want to wear a white suit!'" Cady said. "But I don't really like dresses, I don't like them. They're too itchy." "She felt beautiful in this suit. And she wears suits all the time. She's worn suits for school pictures. She just wore a suit to the daddy/daughter dance in January," said Chris Mansell, Cady's mother. But when the day arrived, Cady was not allowed to wear pants because the church required a dress. "If your daughter wears a suit, comes here in a suit on Sunday, she will not be given communion and will be asked to leave," Chris Mansell said the priest told her. "So my husband said, 'Well, I guess we're done here. I think I'm leaving your church.'" Not only did Cady miss her First Holy Communion, the Mansell family said they've decided to leave the church and move to a different one. On Wednesday, a spokeswoman for St. John the Evangelist released a statement, emphasizing that this was only a dress code issue, nothing more. "St. John the Evangelist uniformly enforces dress codes at our parish school and for religious rites," the statement said. "We often have requests for exceptions to the dress code, ranging from sneakers to the color of one's shirt; thus, we have consistently chosen to adhere to the dress code rather than allowing a myriad of exceptions to it." To Cady's mom, the issue is about wearing pants. And even though a blogger contacted her about the transgender issue, she sees it like this. "The writer said Cady was trans. While I have no problem with that, she is not - or hasn't expressed that. She's 9. Right now, I joke that the only thing Cady identifies as is a Jedi or a Storm Trooper," her mother said. Cady's mother said in her Facebook posts that Cady's pants weren't the only issue. She said the priest at St. John the Evangelist made comments about their parenting and, ultimately, that's the reason the family decided to leave the church.